CRANKSHAFT The 350 SX-F’s crankshaft utilizes a short connecting rod, which makes for an overall compact and lightweight engine with a snappy power delivery. A plain big-end bearing with two force-fitted bearing shells runs directly on the crank pin. This design is a major prerequisite for the extremely high engine speeds and the unrivaled maximum power of the 350cc engine. Not only that, it also enhances the engine’s durability, allowing long crankshaft service intervals – a customer benefit in respect of time, effort and cost. ENGINE MANAGEMENT SYSTEM The 350 SX-F is fitted with an electric starter as standard, which is a clear advantage when it comes to crunch time in the heat of battle. A strong starter motor made by Mitsuba and the proven starter drive will fire time and time again at the push of a button. 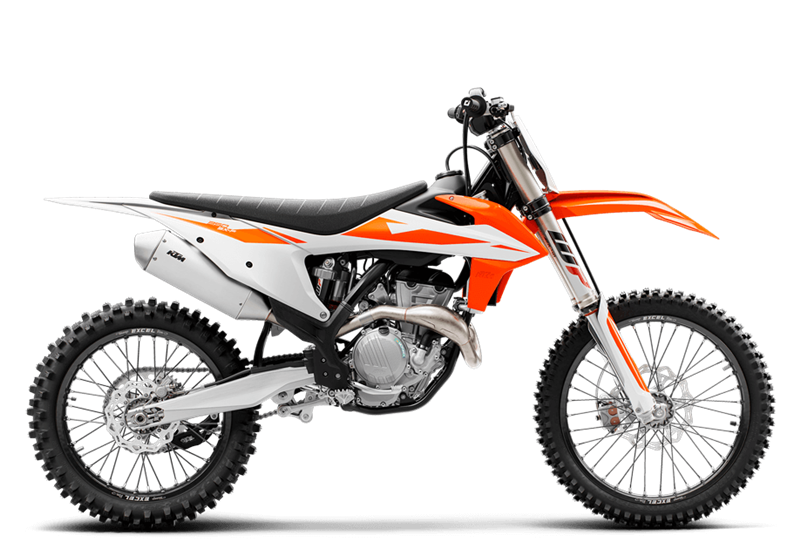 E-STARTER Like all KTM 4-stroke motorcycles, the 350 SX-F is started at the push of a button - a priceless advantage when you’re on the clock. HANDLEBAR MAP SELECT SWITCH All 4-stroke models are equipped with a sophisticated new multi-functional handlebar map select switch, which does three things:Activation of the traction controlActivation of the launch controlSelection of two power curves (Standard or Advanced)The traction control is a unique feature that none of the competitors can offer. It guarantees more efficient traction when the track conditions are less than perfect. Push the button and reign supreme. With this map select switch the rider can also activate the launch control, which provides more efficient starts out of the gate so you can go for the holeshot, time and time again. How? It simply reduces the maximum engine speed for the very first moments of the start, in order to give you better control. Push both buttons when the engine idles and the EFI control lamp mounted on the upper triple clamps will let you know you are READY TO RACE. In addition, the map select switch gives the rider the chance to select an alternative, more powerful map beside the standard configuration. Welcome to the future. EXHAUST Competition noise limits are a real challenge for every manufacturer. Therefore, KTM has put a lot of effort into the development of their exhaust systems. All 4-strokes are fitted with headers that have a unique standard feature; an additional resonator system – a small chamber connected to the pipe. All 4-strokes are fitted with a short silencer, mounted as close to the engine as possible. You know what that means: extra mass centralization and better rideability. Its advanced internal design reduces the noise sufficiently in order to sit safely below the noise limit, while still raising the hairs on your neck. DECALS New graphics convey the READY TO RACE character of the 2017 SX-F model line.